It's a peculiar business strategy, but it seems to have garnered Samsung its marketshare success: Make a ridiculous number of products in every size conceivable and then sell them around the world to anyone who's willing to buy them. And thanks to the new gadgetry Samsung announced at CES 2014, you'll soon have even more devices to choose from. 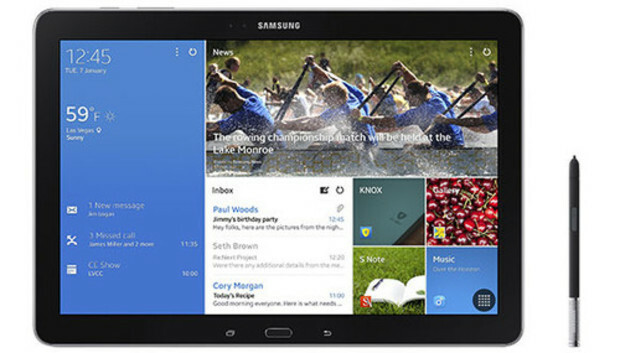 The South Korea-based company added two more tablets to its already hefty lineup, with the introduction of the 12.2-inch Galaxy NotePRO and the Galaxy TabPRO, available in 12.2-, 10.1-, or 8.4-inch variants. These new devices join the 10.1-inch tablet Samsung launched late last year and the bevy of smartphones in varying sizes currently available in the US market. Both the 12.2-inch Galaxy NotePRO and TabPRO feature 1080p WQXGA widescreen displays with 2650 by 1600-pixel screen resolutions. Both tablets also contain a quad-core 2.3GHz Snapdragon 800 processor, 2GB of RAM, and a 9500mAh battery pack, though the 10.1- and 8.4-inch TabPROs feature a 8220mAh and 4800mAh battery pack, respectively. The tablets also feature Samsung's Magazine UX, which we first got a glimpse of when we reviewed the Galaxy Note 10.1 2014 Edition. Magazine UX combines a specialized version of Samsung's TouchWiz interface that takes better advantage of the larger screen with a feature that lets you organize your content and feeds, and then quickly peruse them at your discretion. If you've ever used a reading app like Flipboard, you'll feel right at home with Magazine UX. Both the Galaxy NotePRO and Galaxy TabPRO will also come chock full of other Samsung software features, including Multi Window, which lets you use two apps in two separate windows at once. Only the NotePRO will come packed with the S Pen, however, though both tablets will offer remote access to your computer with the bundled Remote PC application. All four models will be available with Wi-Fi only, Wi-Fi and 3G, or Wi-Fi and LTE. They'll be available later this quarter. No word yet on how much they'll cost.